An attachment-based model of “parental alienation” (AB-PA) – as described in Foundations – is not a “theory” – it is diagnosis. A foundational principle of clinical psychology is that assessment leads to diagnosis, and diagnosis guides treatment. The pathology typically described as “parental alienation” in the popular culture is an attachment-related pathology called pathological mourning (Bowlby, 1980), involving a cross-generational coalition of the child with one parent against the other parent (Haley, 1977; Minuchin, 1974), resulting in an emotional cutoff in the child’s relationship with a normal-range and affectionally available parent (Bowen, 1978; Titelman, 2003). 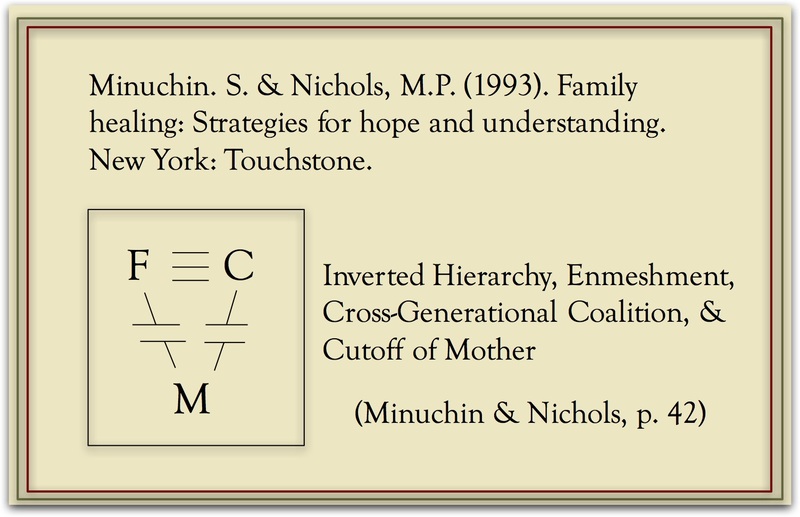 In 1993 (twenty five years ago), the preeminent family systems therapist, Salvador Minuchin and his co-author Michael Nichols provided a structural family diagram on page 42 of their book, Family Healing, for this type of family pathology. Note the triangular pattern of family relationships. This is called the child’s “triangulation” into the spousal conflict. Triangulation is the professional construct for the child being “placed in the middle” of the spousal conflict. Note also, the “inverted hierarchy” created by the child’s elevation in the family hierarchy to a position above that of the targeted parent (the mother in this example) from which the child is empowered by the coalition with the father to judge the targeted parent. An inverted family hierarchy is a highly characteristic symptom feature of a cross-generational coalition within the family. The break in the connecting lines to the mother indicate the “emotional cutoff” of the mother from the father-son coalition. This is the symptom feature everyone is calling “parental alienation” – the child’s rejection of the parent. The child’s rejection of the parent is part of a much larger family systems pathology. This is not some “new form of pathology” that requires unique new symptom identifiers. We absolutely know what this pathology is. Well, at least knowledgeable and competent mental health professionals know what it is. The problem is that the field of professional psychology surrounding this attachment-related family pathology is rampant with profound professional ignorance and incompetence. But the pathology typically called “parental alienation” in the popular culture is a well-understood and well-established form of attachment-related family pathology called “pathological mourning” which is being created by the personality disorder pathology of the allied narcissistic/(borderline) personality parent who has formed a cross-generational coalition with the child against the targeted parent. We absolutely know what this pathology is. So how did we reach this level of profound professional ignorance and incompetence? Gardnerian PAS. Back in the 1980s, a psychiatrist, Richard Gardner, proposed the existence of a new form of pathology – a “new syndrome” – which he called Parental Alienation Syndrome (PAS). But in proposing a new form of pathology which was supposedly unique in all of mental health, Gardner skipped the step of professional diagnosis; the application of standard and established constructs and principles to a set of symptoms. Gardner was correct in identifying a form of family pathology surrounding divorce, but he was incorrect that it represented a “new form of pathology” – a unique “new syndrome” in mental health. It’s NOT a new form of pathology. Gardner was simply a poor diagnostician. The problem we’re facing is that when Gardner skipped the step of professional diagnosis he led professional psychology off into the wilderness of supposedly unique new forms of pathology that are supposedly identifiable by equally unique new forms of symptom identifiers. By leading professional psychology into the wilderness, Gardner opened the door for professional ignorance and incompetence. We need to leave the wilderness of “new forms of pathology” and return to the established path of professional practice – assessment leads to diagnosis, and diagnosis guides treatment. Diagnosis is the application of standard and established constructs and principles to a set of symptoms – no “new forms of pathology” unique in all of mental health. Standard and established constructs and principles ONLY. AB-PA is professional diagnosis; the application of standard and established constructs and principles to a set of symptoms. In diagnosing the pathology from entirely within the standard and established professional constructs of the attachment system, personality disorder pathology, and family systems constructs (as fully described in Foundations), AB-PA returns us to the established path of professional psychology. AB-PA is NOT a theory. AB-PA is diagnosis. We need to return to the established path of professional psychology. The foundational principle of clinical psychology is that assessment leads to diagnosis, and diagnosis guides treatment. Diagnosis is the application of standard and established constructs and principles to a set of symptoms. Diagnosis: The pathology everyone is calling “parental alienation” represents the trans-generational transmission of attachment trauma from the childhood of the allied narcissistic/(borderline) parent to the current family relationships, mediated by the personality disorder pathology of the narcissistic/(borderline) parent that is itself a product of this parent’s childhood attachment trauma. Diagnosis: The pathology everyone is calling “parental alienation” represents the child’s triangulation into the spousal conflict through the formation of a cross-generational coalition with an allied narcissistic/(borderline) parent that is resulting in the emotional cutoff of the child’s relationship with a normal-range and affectionally available targeted-rejected parent. We absolutely know what this pathology is. We simply need to accurately diagnosis it. An accurate diagnosis begins with a proper assessment. A child rejecting a parent is fundamentally an attachment related pathology. The attachment system is the brain system that governs all aspects of love and bonding throughout the lifespan, including grief and loss. The attachment system is the brain system that governs a child’s bonding to a parent. A child rejecting a parent is fundamentally an attachment-related pathology. The attachment system never spontaneously dysfunctions. The attachment system ONLY becomes dysfunctional in response to pathogenic parenting (patho-pathology; genic=genesis, creation). Pathogenic parenting is the creation of significant psychopathology in the child through aberrant and distorted parenting practices. The construct of pathogenic parenting is an established construct in both clinical and developmental psychology and is most often used regarding attachment-related pathology since the attachment system never spontaneously dysfunctions, but ONLY becomes dysfunctional in response to pathogenic parenting. In ALL cases of attachment-related pathology surrounding divorce, ALL mental health professionals should assess for pathogenic parenting by an allied narcissistic/(borderline) parent who has formed a cross-generational coalition with the child against the other parent that is creating the child’s rejection of a normal-range and affectionally available targeted parent. Assessment Leads to Diagnosis: The American Psychological Association requires – REQUIRES – under Standard 9.01a of the APA ethics code that ALL mental health professional conduct an appropriate assessment. If a mental health professional has not even assessed for pathogenic parenting surrounding an attachment-related pathology in the family, despite the fact that the attachment system ONLY becomes dysfunctional in response to pathogenic parenting, then that mental health professional’s “diagnostic statements” and “forensic testimony” CANNOT possibly be based on information “sufficient to substantiate their findings,” and this psychologist would therefore be in violation of Standard 9.01a of the APA ethics code. Notice that NOWHERE in this am I talking about assessing for “parental alienation.” We must return to standard and established professional constructs and principles for assessment, diagnosis, and treatment. Just assess for the symptoms of pathogenic parenting by an allied narcissistic/(borderline) parent who has formed a cross-generational coalition with the child against the targeted-rejected parent. We are NOT assessing for “parental alienation.” We are returning to the path of established professional psychology. We are leaving the wilderness of “new forms of pathology.” We are basing our diagnosis on standard and established constructs and principles of professional psychology; the attachment system, personality disorder pathology, and family systems therapy. Diagnosis is the application of standard and established constructs and principles to a set of symptoms. Assessment leads to diagnosis, and diagnosis guides treatment. Pathogenic parenting that is creating significant developmental pathology in the child (diagnostic indicator 1), personality disorder pathology in the child (diagnostic indicator 2), and delusional-psychiatric pathology in the child (diagnostic indicator 3) is a DSM-5 diagnosis of V995.51 Child Psychological Abuse, Confirmed. Don’t tell me this pathology is not in the DSM-5. It is absolutely in the DSM-5. Page 719: V995.51 Child Psychological Abuse Confirmed. Assessment leads to diagnosis: The Diagnostic Checklist for Pathogenic Parenting. We must return to the path of established professional psychology in order to rid ourselves of the profound professional ignorance and incompetence that disables the mental health response to this attachment-related pathology, personality disorder pathology, and family systems pathology. At the professional level, all mental health professionals MUST return to using the standard and established constructs and principles of professional psychology to diagnose pathology. Assessment leads to diagnosis; diagnosis guides treatment. Once we return to the established path of professional psychology, we absolutely know what this pathology is, and we can absolutely solve it. AB-PA is NOT a theory. It’s diagnosis; it’s the application of standard and established constructs and principles to a set of symptoms. Diagnosis: Pathogenic parenting that is creating significant developmental pathology in the child (diagnostic indicator 1), personality disorder pathology in the child (diagnostic indicator 2), and delusional-psychiatric pathology in the child (diagnostic indicator 3) is a DSM-5 diagnosis of V995.51 Child Psychological Abuse, Confirmed. Assessment leads to diagnosis; diagnosis guides treatment.